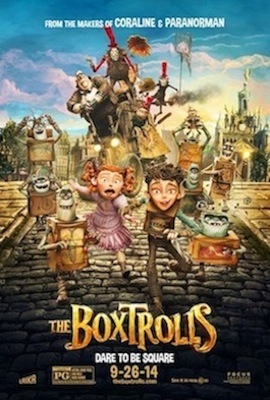 The Boxtrolls is a quirky, fun, stop-motion movie about strength in the face of adversity, friendship, family, and redemption. 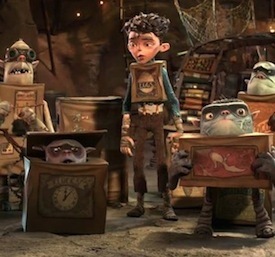 The story revolves around a misunderstanding between the citizens of Cheesebridge and the underground-dwelling, cardboard box-wearing Boxtrolls. One dark night, a citizen sees a Boxtroll taking a human baby underground and assumes that he has stolen the baby to eat. From that point on, a legend about the Boxtrolls is born, depicting the creatures as vicious, people-eating monsters. A nightly curfew is enacted to keep the townspeople off the dark streets and safe from the Boxtrolls. We quickly learn, however, that the baby has not been eaten. Instead, he has been called “Eggs” (after the name of the product on the box he wears) and is being raised and loved by the Boxtrolls. The Boxtrolls themselves are not evil monsters in any way—they’re kindly, scavenging creatures that take useless junk from the city above and use it to power, decorate, or provide entertainment in their handmade city below. They’re inquisitive, friendly, and fun-loving, but also easily frightened. Meanwhile, an ambitious citizen of Cheesebridge named Archibald Snatcher decides to use the Boxtroll legend to his advantage. He aspires to trade in his tall, red hat for a white hat, which can only be worn by men who have earned one through hard work, prestige, or wealth. So Snatcher decides that in order to get his own, he will exterminate the entire population of Boxtrolls. This begins a frightening ordeal for Eggs and the Boxtrolls, who eventually have to learn to stand up for themselves rather than cower inside their boxes when trouble comes. They are helped by a young human girl named Winnie who, in spite of being bit snooty and aggressive, develops a friendship with Eggs. The Boxtrolls is a very clean PG-rated movie, with only one instance where a character clearly takes God’s name in vain. However, there is a but of crude humor and several scenes that could be frightening to young children. Not only is the legend of the stolen baby perpetuated through a somewhat grisly annual holiday in his honor, but children and adults alike share their grim ideas of how the Boxtrolls eat people, describing mountains of bones and rivers of blood under the city. In addition, Snatcher is thoroughly evil and some scenes where he’s chasing the Boxtrolls get fairly dark and intense. For these reasons I wouldn’t recommend this movie for very young children or those who are easily frightened. 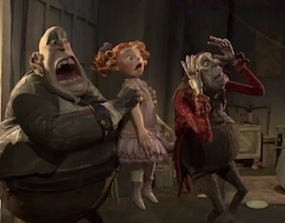 One thing to keep in mind about The Boxtrolls is that it’s very stylized, with detailed and unique stop-motion character artistry. Because of this, many of the characters have exaggerated features that can come off as a bit grotesque to look at sometimes—for instance, Snatcher has greasy, stringy hair, a big hooked nose, horrible teeth, greyish skin, and a large belly that seems to wrap around his whole body. Sometimes he ticked my own gag reflex a bit! But even if you’re not drawn to this particular art style, I do think you will enjoy the movie if you can see past that aspect. UPDATE: After some research, I learned that I missed some homosexual references that occurred after the movie ended (the late hour of the movie's conclusion caused me to beat a somewhat hasty retreat). The second song in the credits titled "Some Kids" contains the lyrics: "Some kids have a mother and a mother/Some kids have a father and a father/Some kids have no one at all/ … We should be glad for the families we have/And reach out to those who are on their own." In addition to a Boxtrolls trailer that depicted a family with two apparently homosexual couples, it seems the makers of this movie had a bit of an ulterior motive. 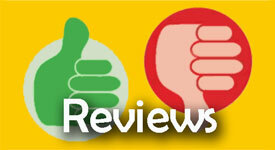 I will note, however, that I did not see any encouragement of homosexuality within the movie itself. The issue of homosexuality is out there—often shoved in our faces—so it's doubtful many kids are unaware of its existence. So rather than completely sheltering kids, I would encourage parents who feel their children are ready for the conversation to use the song in the credits as an opportunity to discuss homosexuality and God's intention that marriage be between a man and a woman. Rebekah Largent is a mom, a wife, and a writer/editor. 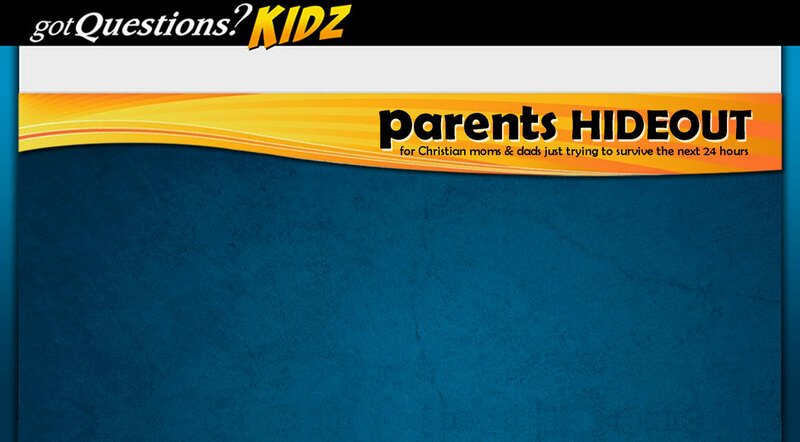 After many years in the children's curriculum industry, she switched over to Internet ministry at Got Questions Ministries. In addition to editing and writing articles for GotQuestions.org, she also manages the GQKidz.org website.